"Stand back, world!" the advertisements blared. "You are witnessing the creation of an incredible new world," and the "most incredible new toy you've ever seen." All this hyperbole concerned a toy competitor for Ideal's Zeroids. In this case, it referred to Topper's Ding-a-Ling Robots, a whole line of toys manufactured in the late 1960s and released in 1970. 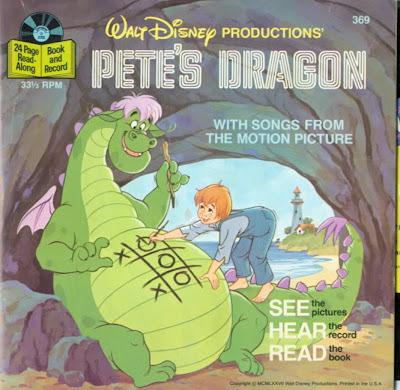 Topper created several Ding-a-Ling robot characters with various jobs, including Fireman, Shoe Shine, Answer Man, Spy, Boxer, Rocky, Chef, gopher, Claw and Police Man. And then, those robots -- thanks to an innovative, interchangeable power pack -- could "defy all laws of gravity" and walk glide or race across "special skyways." They could also drive their own vehicles. 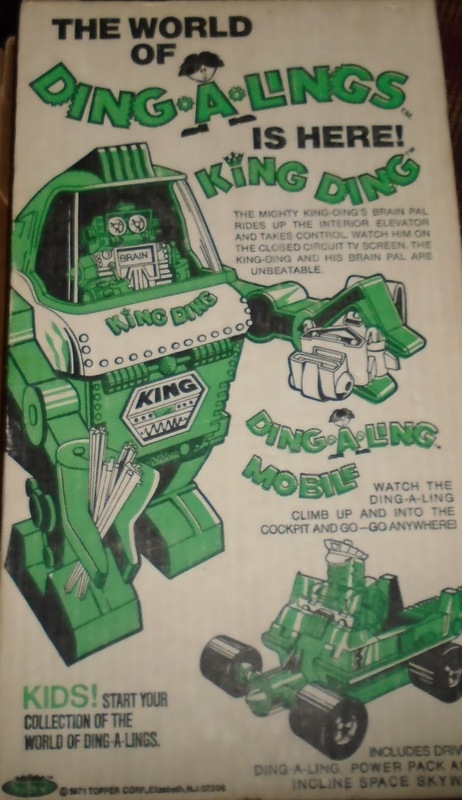 The greatest Ding-a-Ling, however, was "King Ding," a giant robot that dwarfed the rest. 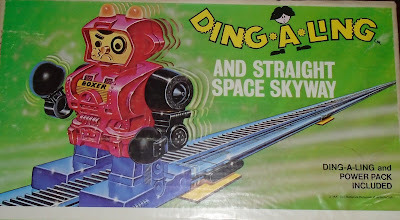 No doubt this all sounds terrific, but the Ding-a-Lings never made a huge mark on the toy market of 1970. Personally, I discovered them in the mid-1970s, as a kid, on the secondary market. Week after week, we would see the Ding-a-Lings at yard sales, selling for about a dollar a piece. I soon had in my possession Brain (the Ding-a-Ling driver of King Ding), the snap-handed Claw, and Fireman. I loved these little, hand-held robots, and I remember my Dad customizing them with special paint and decals. This worked for me because in their original, mint state, the robots are a bit too bright and colorful. My Dad -- a consummate modeler -- dirtied them up for me, so they looked like they had a history and a story. These days, my son Joel is big into robots, and so I found for him on E-Bay a few Ding-A-Lings, and at least two of the special skyways. In particular, I bought the "straight space skyway" and the "Pyramid Set" you see pictured in this post. He wants the King Ding, more than anything, but those toys cost a fortune. If I ever get my hands on one, I'll let you all know. I had Claw, Brain (the Ding-a-Ling driver of King Ding) and King Ding. Great boyhood memories for me in the '70s.